Green Car Congress relays news of a new report released today by the Australian Minister for the Environment and Heritage, Senator Ian Campbell, that concludes that climate change may be occurring at a faster than most scientists had previously thought. The report, Stronger Evidence but New Challenges: Climate Change Science 2001- 2005, confirms the patterns of climate change described in the authoritative Intergovernmental Panel on Climate Change's Third Assessment Report (TAR), released in 2001. However, based on new evidence released between 2001 and 200, the Australian report concludes that there is now a much greater risk of reaching or even exceeding the TAR's upper estimate - an increase in global average temperatures of 5.8° C - by the end of 2100. The TAR report estimated that the degree of global warming by the end of this century would result in temperature increases between 1.4 and 5.8° C. In part, the range of estimates is due to uncertainty about the nature and strength of processes that could dampen or amplify the initial greenhouse gas (GHG) 'forcing' (i.e., the effect of GHGs on atmospheric temperatures). The radiative properties of aerosols. Estimates are now moving towards a higher cooling effect for aerosols—small particles suspended in the atmosphere that generally scatter incoming solar radiation and thus cool the Earth’s surface—than previously thought. In other words, as greenhouse gas concentrations increase and aerosol loadings are reduced, warming increases. 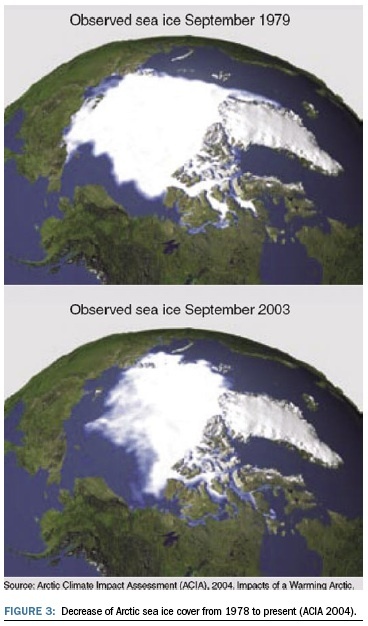 A decrease in albedo. 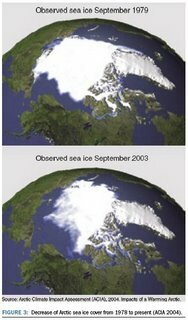 Albedo - the reflectivity of the Earth’s surface - is decreasing due to the melting of snow and ice, with the most extreme example being the Arctic Ocean. Retreating ice and snow expose darker underlying land and ocean surfaces, leading to enhanced absorption of sunlight and further warming. Changes in the terrestrial carbon cycle. Several processes—the oxidation of soil organic matter, the number and areal extent of major disturbances such as fire, and the stability of carbon pools in wetlands and frozen soil—are all sensitive to climate. As temperature rises, these processes in general release further amounts of carbon to the atmosphere, forming a feedback loop that intensifies the warming. Although much uncertainty still surrounds the timing, rate and magnitude of these effects, they all operate to amplify the initial greenhouse warming. Thus, there is now perceived to be a greater risk that the upper end of the well known IPCC TAR estimate of a 1.4 to 5.8°C temperature rise will be reached or exceeded by 2100. The observational evidence which supports the fundamental principles of climate change science has grown even stronger in the post-TAR years. The atmospheric concentration of CO2 continues to increase, and several lines of evidence, most notably isotopic analysis, attribute most of this increase to the combustion of fossil fuels. The instrumental record showing a warming Earth is supported by satellite measurements of tropospheric warming and by observations in the cryosphere and biosphere. The heat content of the upper layers of the ocean is increasing. A growing number of reconstructions of surface temperature over the past 1000 to 2000 years shows that the sharp temperature rise over the past century is now beyond the bounds of natural variability. The imprint of greenhouse gases as the primary cause of the observed warming has also become clearer. The pattern of heat uptake in the world’s ocean basins agrees well with that simulated by climate models for greenhouse gas forcing. The observed moistening of the upper troposphere accords with expectations for greenhouse gas-driven changes in atmospheric water vapour content. In summary, post IPCC TAR research has confirmed with stronger evidence the patterns of climate change described in the TAR. The lead author of the report is Will Steffen, Executive Director of the International Geosphere-Biosphere Programme (IGBP) from 1998 through mid-2004 and, since then, IGBP Chief Scientist and Director of the Centre for Resource and Environmental Studies at the Australian National University [where I studied for a semester in 2005, BTW]. "I have drawn on the work of thousands of scientists around the world; however, the selection of the material to be incorporated in this synthesis, the emphases made and the inferences drawn are entirely my own. They do not necessarily represent the views of the IGBP, the Australian National University, the Australian Greenhouse Office or the Australian Government"
Along with the United States, Australia was one of only two industrialized nations that opted out of the Kyoto Protocol agreement. However, unlike the United States, Australia is reportedly on track to meet what would have been its obligation under the Kyoto terms - an 8% increase in greenhouse gas emissions above 1990 levels. According to a press release also issued today by Senator Campbell, Australia is still on track to meet its internationally agreed target of 108 per cent of 1990 emissions despite strong growth in energy consumption. “The accounts show our emissions have increased by 2.3 per cent between 1990 and 2004, which is where we need to be to meet our target,” Senator Campbell said. Australia is also part of the US-led Asia-Pacific Partnership on Clean Development and Climate [for whatever good that is...].